Q: What is the difference in blogging a book and booking a blog? A: There’s a huge difference. When you blog a book you actually write a new book from scratch on your blog. When you book a blog you repurpose your old blog posts into a book. Let me explain. When you blog a book, I suggest you approach the project just as you would any book project. When you first get the idea, evaluate its viability. By this I mean, find out if your idea is unique by comparing it to already published books, decide if there is a market for your book, determine if there is a need for your book. Look at your book idea through the eyes of an acquisitions editor to determine if it has a chance of succeeding both as a book in online and brick and mortar book stores and in the blogosphere. In other words, see how your idea holds up against other books and blogs. If you think your idea is viable, then come up with a content plan and chunk the content down into post-sized bits. Write your book in short pieces just long enough for a blog post—about 250-500 words in length. Come up with a schedule, and write these posts first into a word processing program on that schedule. You will then copy and paste and publish these on your blog, sticking to that schedule, consistently over time on your blog. So, if you write three days a week, you post three days a week. Each post takes just 30 minutes or so to write and a bit longer to post. In this way, you create a manuscript and “blog your book” into existence. Now, when you book a blog you actually go back and search through your blog looking for posts that will fill in the content plan for a book. You first create that content plan, and then you go through your blog posts looking for posts to create a manuscript. You can do this in a variety of way, such as simply reading through all your blog posts, using your blog’s search box and keywords, searching for posts using the tag or label function, or looking in specific categories. You then copy and paste the relevant blog posts into a word processing document to create a manuscript. Viola. A booked blog. Q: How can non-fiction authors benefit from blogging a book? A: They can benefit in many ways! First, when you blog a book you get your book written. Eighty-one percent of Americans say they want to write a book, but only about two percent actually write a book. If you blog and write a short post a few times a week you will get your book written in those short increments of time. I wrote the first draft of How to Blog a Book: Write, Publish, and Promote Your Work One Post at a Time in just five months. How? Blogging provided me with a consistent writing practice with accountability partners—readers. They wait for me to keep posting installments, and if I quit before I finished, I failed publicly; no one likes to do that. For most people, the fear of failing publicly keeps you writing, or blogging, until you finish. Second, when you blog a book you build an author’s platform, or a built in base of potential readers. Think of this like a fan base ready to purchase your book when you say it has been released. The longer and more consistently you blog, the more blog readers you gain. These are potential book buyers as well. If you tie your blogging into your social networking, you will also gain fans and followers on these networks. This builds an author’s platform that will help your book succeed once you finish blogging it and turn it into a printed book or an ebook. Third, a blogged book works like a test marked book idea, as does a blog in general. That’s why publishers and agents troll the internet looking for successful blogs. A blog with lots of readers represents a successfully test marketed book idea, which is why so many blogs continue to land blog-to-book deals from traditional publishers. Today, more bloggers are landing book deals than ever before, and for nonfiction authors this is a great benefit to blogging a book. You could land a book deal. If you don’t, you can publish a successful book yourself from your blog—and your blog will already have produced a book. You have no need to go back and book your blog. Fourth, and this goes along with platform building, blogging a book allows you to promote yourself and your work a you write your book. That platform you build comes from content marketing. The more content you produce and the more you tell people you’ve produced it—via your social networking, your newsletter, ezine articles, word of mouth, and by sheer discoverability of your blog—the more you drive people to your site, and ultimately to your book. Blogging, in general, is a superb promotional tool. Q: Should authors be concerned about copyright issues? A: No, authors should not. When you hit the “publish” button on your blog, you basically copyright the material by publishing it. Under the Copyright law of 1976, which went into affect in 1978, any work created in a fixed form is protected by copyright upon creation. So, when a work is put into any fixed form—printed out from your office printer, published as an e-book, booklet or POD book, or sent out into Cyberspace as a blog post, your written work is protected by copyright. That means your completed and published blog post, or all the posts that comprise your blogged book, represent written works created in fixed form, thus they are protected by copyright. It’s a good idea for writers to print out their work, including blog posts, before actually posting them on the Internet, but if you post often, that’s a lot of paper to have hanging around. You could actually file your work with the copyright office, but, again, if you produce a lot of writing, such as daily blog posts, that can get expensive and time consuming. That said, if you want to sue someone for infringement and collect damages, if you worry about being infringed, or if you ever want to bring a lawsuit against someone for infringement and want to collect money, having a document that says you own the copyright to your work certainly can be a useful. You can put a copyright sign on your blog somewhere. I find there is very little theft of content going on. Occasionally content gets “scraped,” and used verbatim on another blog without acknowledgement. You can usually get it taken down. More often you find your work copied and cited correctly with a link back to your blog. I always say—and someone said this first, but I’m not sure who—you should be more afraid of not having your work found than of it being stolen. If it’s being stolen, you’re discoverable, and discoverability is everything when it comes to blogging or blogging a book. Q: Who else should consider blogging a book? 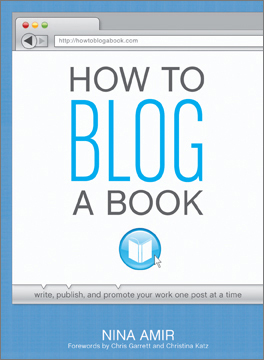 A: In particular, businesspeople, or entrepreneurs, should consider blogging books. A blog will help them increase their discoverability both locally and nationally (or globally), thus increasing their sales and leads. The more entrepreneurs blog, the higher up in the search engine page ranks their website or blog will move, making it easier for customers and clients to find them. Plus, if they blog a book, they will be seen as the expert in their field. Customers and clients will almost always buy from the expert author over someone who just hands them a business card or who is not seen as an expert or authority. When potential clients and customers see that the business owner, coach or consultant is an expert author, and the subject of the site is relevant to their web search, they will click through to that website, for example. Memoir writers and fiction writers also are finding blogging a book to be a useful promotional tool. It’s a bit harder to blog memoirs and novels, but it can be done—and it is being done. Q: How can blogging a book lead to speaking engagements? A: By blogging, or blogging a book, you become the expert on your topic. But if you blog a book, you become an author expert as well as an expert blogger. You are then more likely to get speaking engagements. Take your blogged book to the next level—off the blog—and get it published—traditionally or as an indie publisher—and you again increase your chances of landing speaking gigs. Also, organizations looking for speakers do so these days on the internet using search engines. The more you blog, the higher likelihood you have of being found by someone searching for a speaker. Blogging a book is a superb way to add high-quality content to a blog and become searchable, achieve expert status on line and rise up in the page ranks quickly and organically. The same is true of the press, by the way; when they want to find an expert, they look online. Q: Where can folks find more info on you and your book? A: They can visit the How to Blog a Book blog, http://www.howtoblogabook.com. They can also visit either http://www.copywrightcommunications.com, my website centered on writing and publishing, or http://www.ninaamir.com, my website that works as an umbrella to point people to everything I do—all my websites, blogs, online columns, etc. Nina Amir is the Inspiration-to-Creation Coach, who inspires writers to create the results they desire with publishable and published products and careers as writers and authors. 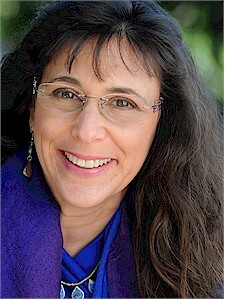 She is the author of How to Blog a Book, Write, Publish and Promote Your Work One Post at a Time (Writer’s Digest Books), and a seasoned journalist, nonfiction editor, proposal consultant, blog-to-book coach, and book and author coach with more than 33 years of experience in the publishing field. Additionally, she is a popular speaker on topics related to publishing and writing and the regular writing and publishing expert on the Dresser After Dark radio show. Nina is the founder of Write Nonfiction in November, she writes five blogs, including Write Nonfiction NOW! and How to Blog a Book, and has self-published 10 short books. Also a popular human potential and spiritual writer and speaker, in all she does Amir encourages people to combine their purpose and passion so they Achieve More Inspired Results.